SCOTTSDALE, Ariz.--(BUSINESS WIRE)--Magellan Rx Management, the pharmacy benefit management (PBM) division of Magellan Health, Inc. (NASDAQ: MGLN), released new data today showcasing results from its medical pharmacy program focused on biosimilar management. The results revealed that health plan organizations saw a significant shift in utilization from high-cost drugs to lower-cost biosimilar formulations after implementation of a medical benefit drug management solution, yielding substantial drug cost savings while maintaining a high level of clinical quality. The program leverages a comprehensive utilization management (UM) solution to shift utilization to the lower-cost biosimilar versions of infliximab, which is used to treat autoimmune conditions such as rheumatoid arthritis and inflammatory bowel disease. In support of this initiative, a team of highly-trained pharmacists developed a robust clinical policy, working with physician offices and hospitals to ensure appropriate utilization for each patient’s unique situation. Though not considered directly interchangeable with their innovator brand counterparts, biosimilars are regarded as providing the same levels of clinical efficacy and safety, while offering the added benefit of potential cost-savings to payers and patients alike. 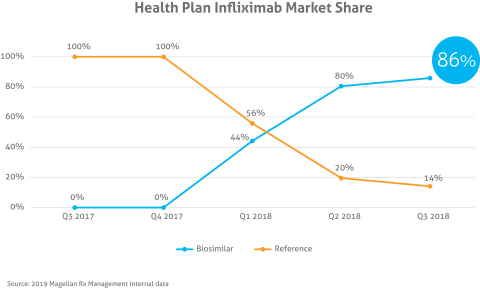 According to the latest edition of the Magellan Rx Management Medical Pharmacy Trend ReportTM, Remicade, the brand name for infliximab, is the highest-spend drug on the medical benefit.1 Although biosimilar competition for infliximab has existed since 2016 in the United States, health plans have continued to see an increase in infliximab spend, including a 14 percent increase in Remicade per-member-per-month (PMPM) for commercial health plans from 2016 to 2017.1 It’s reported that payers spend $43,000 per patient annually1 on the reference brand, yet the ingredient cost of biosimilars can be up to 35 percent less.2 Furthermore, medical pharmacy management strategies coupled with benefit design changes can have meaningful impact on lowering patient out-of-pocket costs. 1. 2018 Magellan Rx Management Medical Pharmacy Trend ReportTM, ©2019. About Magellan Rx Management: Magellan Rx Management, a division of Magellan Health, Inc., is a full-service, next-generation pharmacy benefit manager (PBM) that helps our customers and members solve complex pharmacy challenges by connecting them to the people, technology, and information they need to make smarter healthcare decisions. As experts in managing specialty spend both on the prescription and medical benefit, we are energized by discovering new and better ways to deliver solutions in today’s complex and rapidly-evolving healthcare environment, leading people to live healthier, more vibrant lives. Magellan Rx Management has released new data showcasing results from its medical pharmacy program focused on biosimilar management.